For some reason whenever I think of nachos the weird orange cheese and stale chips they serve at sporting events is what comes to mind. 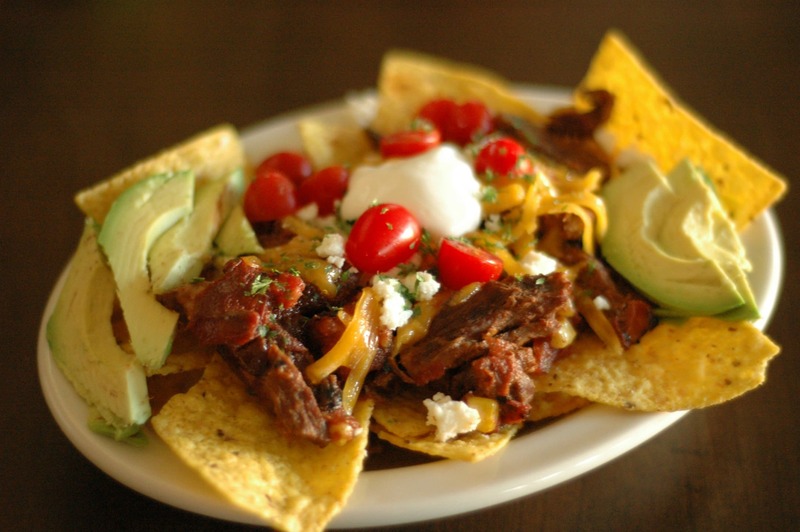 It never occurred to me that I could make nachos at home. And better yet that they could actually be a meal for my family. A delicious meal that we were all raving about, in fact!! 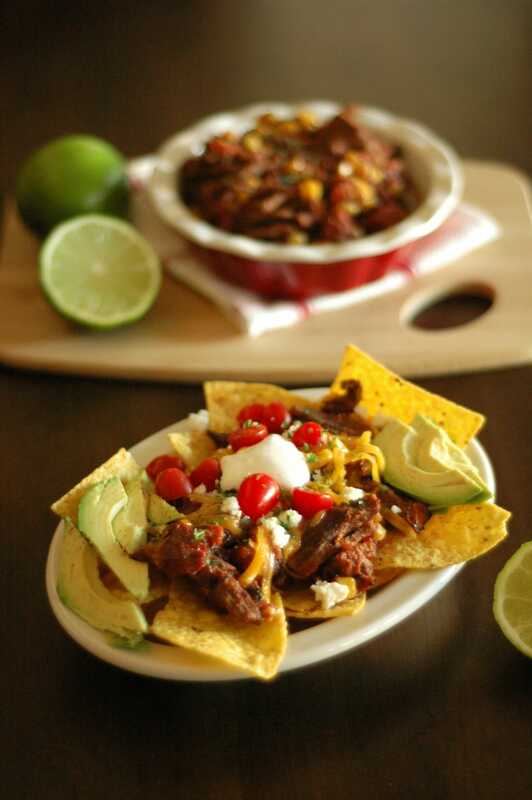 These Slow Cooker Chipotle Beef Nachos with Roasted Corn and Tomatoes are the result of seeing some yummy looking photos of nachos over on Pinterest and then digging through my cabinet to see what I might be able to concoct! I love how some of my favorite meals come from throwing things together in the crock and waiting to see what come out! Of course there is cheese in here but none of that processed orange stuff…what is that anyway? I used some bolder cheeses that could stand up to the flavor and spice of the meat and went with extra sharp cheddar and queso fresco. If bold cheeses aren’t your thing then a monterey jack would be tasty! Topping it all off are some fresh tomatoes, sour cream, cilantro and avocado!!! A perfect balance to the spicy chipotle flavors! I used a skirt steak for this and it was perfect. I cut it in half longways and then sliced it thin before I threw it in the crock. Then I went and read about skirt steaks and found out I probably did it wrong. Oops. Well, that’s why I love the crockpot! It came out so tender you’d never know the difference. Except I just admitted it to you. So watch a video on YouTube if you want to slice it properly…or be a rebel like me! 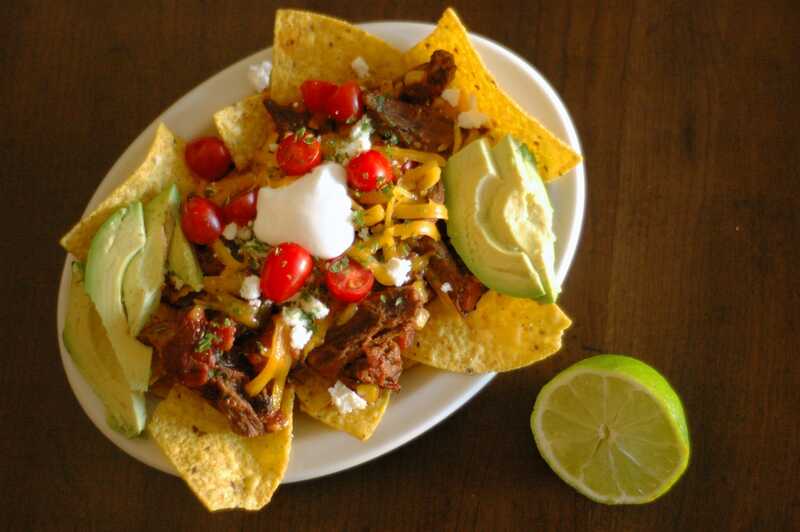 If you had a weird preconceived notion of nachos like I did (or even if you didn’t)…here you go! 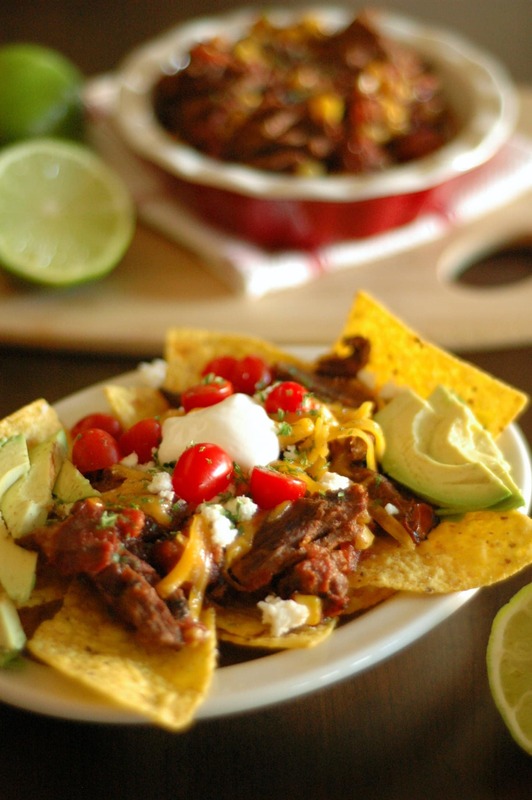 Delicious, grown up, flavorful nachos that you can be proud to serve for a family dinner or your big Super Bowl party!! Place steak, corn, peppers, tomatoes, vinegar and spices in crock. Cook on low for about 8 hours. Pour lime juice over meat and stir to combine. If you can't find frozen roasted corn you can roast regular frozen corn in a skillet with a tablespoon of olive oil for a few minutes until it browns. This is all my favorite flavors in one dish…this looks amazing!! I am checking this out from the chef in training link party and I pinned this!